Below are common attributes associated to Silver Mist Juniper. Become a care taker for Silver Mist Juniper! Below are member comments regarding how to plant Silver Mist Juniper. No comments have been posted regarding how to plant Silver Mist Juniper. Be the first! Do you know how to plant Silver Mist Juniper? Below are member comments regarding how to prune Silver Mist Juniper. No comments have been posted regarding how to prune Silver Mist Juniper. Be the first! Do you know how to prune Silver Mist Juniper? Below are member comments regarding how to fertilize Silver Mist Juniper. No comments have been posted regarding how to fertilize Silver Mist Juniper. Be the first! Do you know how to fertlize and water Silver Mist Juniper? Below are member comments regarding how to deal with Silver Mist Juniper's pests and problems. No comments have been posted regarding how to deal with Silver Mist Juniper's pests and problems. Be the first! Do you know how to deal with pests and problems with Silver Mist Juniper? Looking for Silver Mist Juniper? Get Silver Mist Juniper fresh and large directly from the grower to your garden! Buy Silver Mist Juniper online from the nursery wholesalers and save BIG! I've seen no serious pest or disease problems with Silver Mist Juniper. Consistently wet soil can cause root rot. Silver Mist Juniper is a very drought tolerant plant that should be planted in well-drained soil and in full sun. 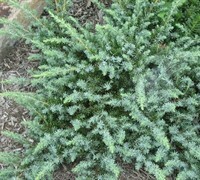 This juniper is great for use as a groundcover plant on steep slopes or as a wide border in landscape beds. Also nice as an under-planting for Japanese Maples and other small trees. Feed Silver Mist Juniper in spring with a slow-release shrub & tree type fertilizer that includes a micronutrient package. Silver Mist Juniper requires little if any pruning.